Crime Stoppers accepts tips and information about crimes in order to solve or prevent such crimes. That includes our four legged community members as well. Study after study has shown the direct connection between abuse of animals and criminal activity by humans. Please remember when you make a report to Tri Cities Crime Stoppers, all tips are anonymous. Help prevent animal abuse and neglect. Say It Here. Keep your eyes and ears open. 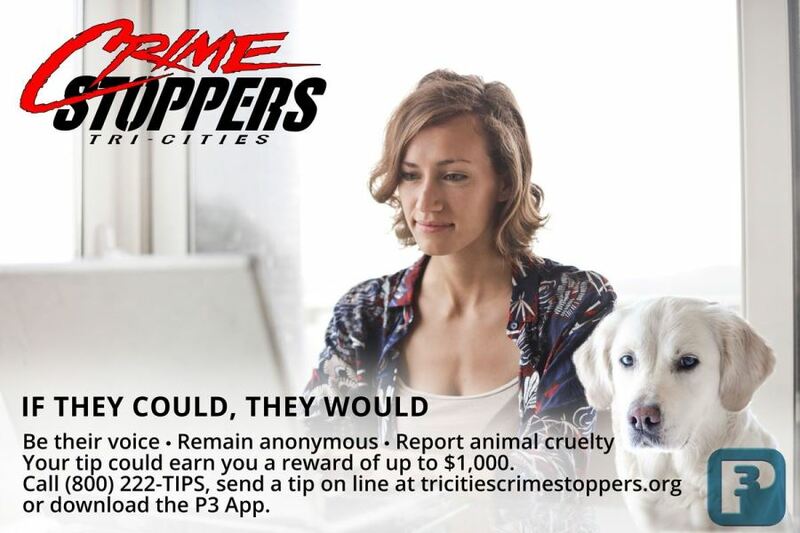 Report animal abuse and neglect at (509) 586-8477, (800) 222-8477, submit a tip online or download our the P3 mobile app if you have information on any ongoing criminal activity. Help Support Animal Abuse Crime Stoppers. You can designate your donation for Animal Abuse Crime Stoppers. Crime Stoppers is funded through your Donations. 71%-83% of women entering domestic violence shelters reported that their partners also abused or killed a family pet. Pet abuse has been found concurrent with 88% of the families under supervision for the physical abuse of their children. 70% of animal abusers go on to commit other crimes. Pets with open sores, healed wounds or an injury or illness that is not being treated. Pets that are extremely or emancipated. Are bones visible? Pets that are covered in fleas, ticks or other parasites. Pets with heavy discharge from eyes or nose. Pets whose collars or chains so tight they have become embedded in their neck. Pets kept outside in inclement weather without adequate shelter. Pets left in unsanitary environments without food or water. in the first degree (a class C felony) when he or she intentionally inflicts substantial pain on, cause’s physical injury to, or kills an animal by a means causing undue suffering, or forces a minor to inflict unnecessary pain, injury, or death on an animal. in the second degree (a misdemeanor) if, under circumstances not amounting to first degree animal cruelty, the person knowingly, recklessly, or with criminal negligence inflicts unnecessary suffering or pain upon an animal. in the second degree the owner knowingly, recklessly, or with criminal negligence fails to provide the animal with necessary food, water, shelter, rest, sanitation, ventilation, space, or medical attention and the animal suffers unnecessary or unjustifiable physical pain as a result of the failure, or if he or she abandons the animal. Is a sadistic “contest” in which dogs- specifically bred, conditioned and trained to fight, are placed in a pit or arena of some type, to fight each other for the spectators’ entertainment and gambling. Denial of the inability to provide this minimum care and the impact of that failure on the animals, the household and human occupants of the dwelling. Help keep animals and citizens safe when you come across a stray or lost pet. Take the animal to a vet to check for a microchip and to be checked out. If there is no microchip, post the animal as found online on various animal sites. If no one claims the animal, use Facebook and other online outlets to promote it. Take pictures and include as much information about the pet that you have. If no one claims the animal, and you cannot take it yourself, contact the appropriate animal shelter for assistance. No one organization can do this alone. Want to join in this effort? Become a part of the Tri Cities Crime Stoppers Animal Abuse group. Contact us at our business line(509) 582-1351.